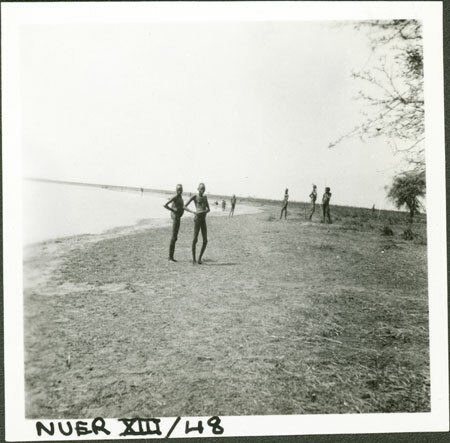 Youths standing along the shore of the lake visited by Evans-Pritchard when crossing Nuerland in 1936 after completing a survey of the Luo in Kenya, on his way to Western Nuerland. In other images the youths can be seen fishing with large harpoons in the water. Note on print reverse ms pencil - "1 10" & print front border ms ink - "NUER XIII/48"
Morton, Chris. "Nuer fishing" Southern Sudan Project (in development). 03 Jan. 2006. Pitt Rivers Museum. <http://southernsudan.prm.ox.ac.uk/details/1998.355.624.2/>.